The executive committee of Mountain Wilderness met in Morbegno Italy to discuss the status of the organization and to review various projects. 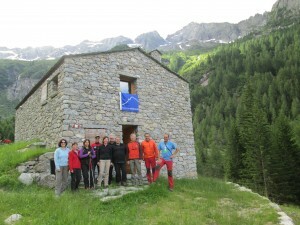 On the agenda was the Casera Pioda, a ruined sheepfold, (located in Val di Melo, Sondrio county, Italy), proposed to be reconstructed in conjunction with ERSAF (a Regional Agency providing Services to Agriculture and Forestry – an entity of the Regional System of Lombardy carrying out operational activities for the state), to become an education center on wilderness for Mountain Wilderness International. After 8 years of works the buildings and surrounding areas have been rehabilitated and the Executive committee paid a visit to see what it had become. It was a great surprise for all to see the quality of the renovation and the facilities it offers for the courses. A nature route surrounds the site and will provide a living experience to participants of what the flora and fauna of the region can offer. The legendary Italian hospitality was appreciated by all and especially the exceptional rizzoto prepared by Stefano Mayr a very dedicated person together with Antonio Scarpa to the realization of the project.